Are you in a wheelchair like me? Have you ever been in a business or a store and felt you were taking up space? Or perhaps have you sat in the waiting room of a doctor’s office only to be asked to move? In my case, this has happened more than once. “Excuse me, please,“ they might say. Or “can you move?” Occasionally, I’ll just get silent eye contact or a pointed glance to let me know I’m in the way. If you live with a disability that requires you to use a wheelchair or a walker, you may have experienced all of the above and more. Sometimes, I even encounter places that still aren’t fully wheelchair-accessible in 2019. On the upside, many businesses have options for better accessibility and updated accommodations. However, most of the time, I feel like I’m going through an obstacle course just to run daily errands. Many times in waiting rooms, no adequate spacing exists to accommodate for the size of wheelchairs. The surprising thing is that even when I do find a perfect space between the array of neatly lined couches and armchairs, people still stare. I wonder if they still think I’m in the way, even when I’ve given them plenty of space. Upon reviewing the Americans with Disabilities Act (ADA) guidelines, it’s “readily achievable” for businesses to accommodate persons with disabilities. In other words, a person with limited mobility or a person in a wheelchair should have adequate space for moving without difficulty. Find out more about the ADA and an overview of its guidelines here. The only thing I know to do is write or call a business or facility about the issue. First, I make sure to let them know how happy I am with their services. After that, I address how difficult it can be for people in wheelchairs to get around their business, office, or facility. Sometimes I just stop saying anything when nothing changes. Even I know I must sound like a broken record. Nevertheless, it’s exciting to see many corporate offices have been kind to take the matter seriously. However, I’m still waiting for a couple of businesses in my town in Texas to take away the shelving they recently placed all the way down the open aisle. Sound strange to you? Well, this placement isn’t a problem for able-bodied people who can walk around. For me, though, I get nervous about that glass shelving, seeing an accident waiting to happen. 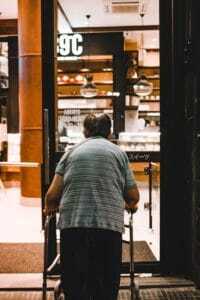 For many people who can move and walk easily every day, thoughts about needing adequate space and accessibility options for others probably never crosses their minds. As a woman navigating life from her wheelchair as best she can, all I can do is keep making it a point to say something. I have to do what I can to impact a positive change, not just for me but for others who come after me too.